I'm Danielle and I am a stand for Africa Yoga Project. I have been banging on an African drum for over 7 years - I don't know the REAL way to play it, I have never really learned the different strokes or notes or the terminology, but I have always felt the beat in my heart. I had no idea when I bought my djembe years ago at a musical festival that my connection to Africa would be WAY bigger than the beat of a drum. Today I announce with wide open eyes and even more wide open heart, that I am an Ambassador for Africa Yoga Project. 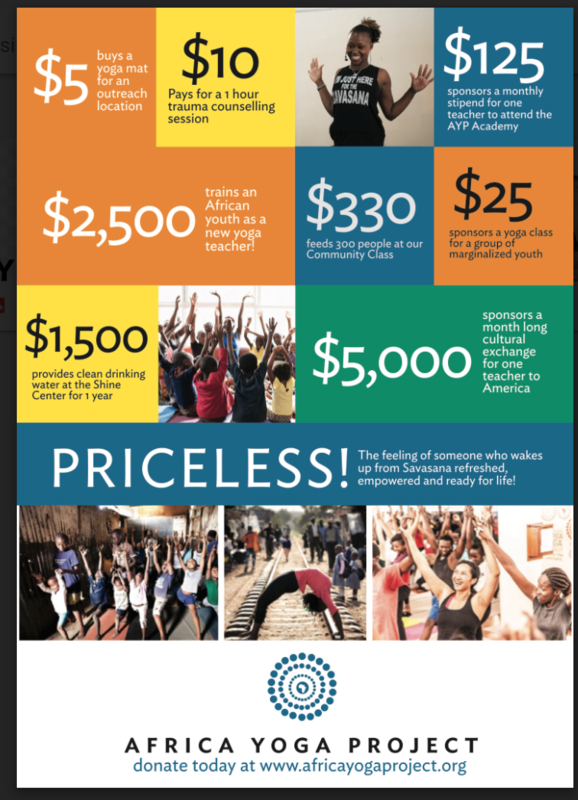 Over the next 12 months I will be raising $10,000 to support AYP in its mission to Educate, Empower, Elevate and Expand Employability with youth in Africa using the transformational practice of yoga. AYP's vision is to create opportunities for youth to step into their greatness and become self-sustaining leaders in their communities. My first look into the world of Africa Yoga Project was making friends with two teachers from Kenya, Patrick and Millie. I met them at my Baptiste Level 2 program and loved their bright smiles, amazing hugs, and overall authentic way of being. 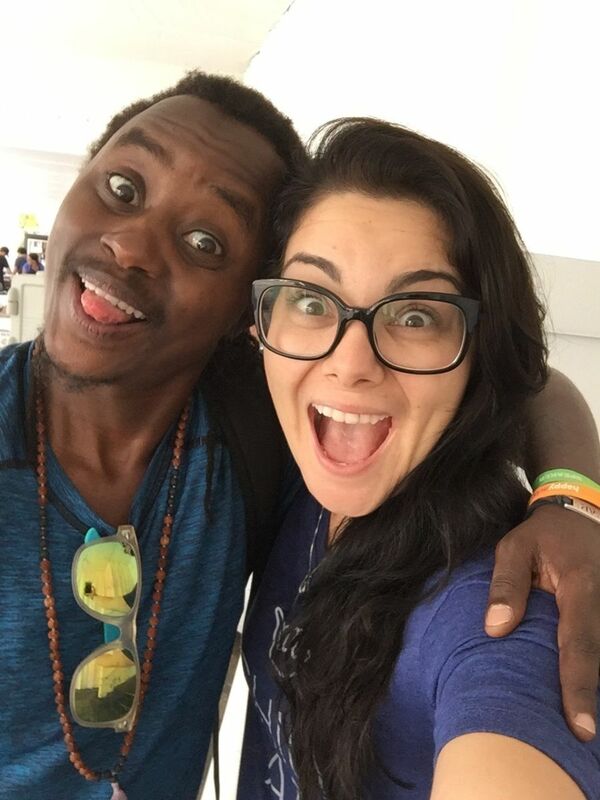 Soon after Level 2, I became a Mentor with Africa Yoga Project and met Caroline. Every month Caroline & I meet over Skype and create a vision, what it looks like for each of us to really BE UP TO SOMETHING. "what STOPS me in my tracks, what do I say to myself, when I decide not to do something I really do want to do?" 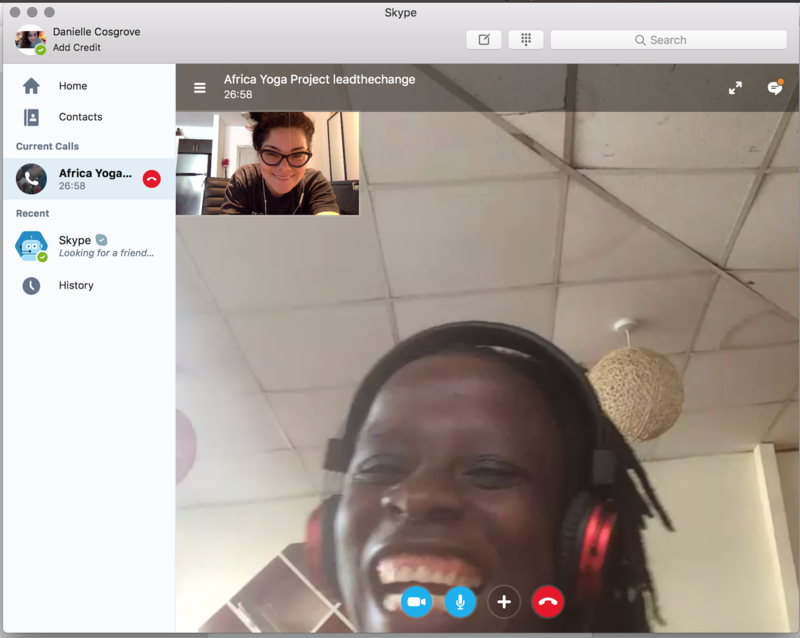 I am committed to supporting Patrick, Millie, Caroline, and so many others who will go through AYP's teacher training programs and come out not just as yoga teachers, but as GLOBAL WELLBEING LEADERS in an industry that is growing quickly in Africa. Did you know... over 70% of young people in Nairobi are unemployed? It's hard to see the light at the end of the tunnel when you live amidst a statistic like that. Through AYP, over 250 young people, trained as teachers, are earning a living wage by teaching yoga to people who otherwise would not have the opportunity. For me, yoga was the light. When I found it, it gave me a sense of purpose and passion. It lit up so many parts of me that I didn't even know existed. It has showed me COMMUNITY and UNCONDITIONAL LOVE and HOPE. When life seems dim, for anyone, yoga can be the lighthouse. Because of AYP, over 6,000 people participate in more than 300 community yoga classes weekly in 80 locations across 13 different African countries. I am a YES for Yoga in Africa. I am a YES for jobs, income, professionalism and entrepeneurial sustainability for young people in Africa. I am a YES for bringing hope, knowledge, and skills to African communities in 13 countries who may otherwise not have access. $5000, $1,500, $125, $125, $10, $5.... it goes a long way. See the poster below! Amber Netz 07/25/2018 $35.00 Block made by Edwin! Warrior ONE 01/11/2018 $277.00 YES! Justin Statt 01/01/2018 $40.00 For the amazong work in Kenya! Amelia Andaleon 09/15/2017 $30.00 You go Danielle!! Emily Byrd 09/11/2017 $40.00 Love you and Kenya! Keep up the good work! Allison Palmer 07/21/2017 $50.00 You're doing great things! Cindy and Ron Morelli 06/26/2017 $37.00 It was inspirational meeting Millie taking her yoga class and learning of her story and journey. Thank you for this opportunity! Shine On!! Stephanie Loy 06/23/2017 $35.00 Great cause! Warrior ONE 06/22/2017 $908.00 Thanks for sending Millie to light up our studio! Libby Jackson 06/21/2017 $250.00 Danielle- thanks for your energy and willingness to share. Amy Ustjanowski 06/21/2017 $56.00 Thank You! Christina Crossley 06/21/2017 $35.00 Thank You!! Mallory and Brian Fox / Thomas 05/21/2017 $100.00 HAPPY BIRTHDAY!!!! So proud of you and so excited to support you in this journey. It comes full circle! Much love and light. Leah James 05/18/2017 $50.00 Go change the world!! Judy Hines 05/18/2017 $50.00 Stay Yoga Strong !! Lizbeth Lieberman 05/18/2017 $25.00 Thank you for being a positive in this world and an inspiration. Kim E 05/17/2017 $25.00 You're amazing! Get it! Connie Myers 05/04/2017 $250.00 Keep spreading the Yoga love! Allison Palmer 04/21/2017 $50.00 a dollar for every mile I run next weekend!